Nagi hosted a Cuban-style meal, complete with the Versailles-inspired “Famous Garlic Chicken” and roast pork, so I added a small contribution by making the accompanying rice. To go along with the theme, I had no choice but to make the rice that I always see served at Cuban restaurants – it’s usually a vibrant yellow-orange color and slightly piquant in taste. The color comes from the annatto seeds, which are produced by Achiote trees, native to the tropical Americas. The flavor reflects the annatto, which I didn’t have on hand, along with a few other spices. Luckily, I found annatto in both ground (which I opted for) and seed form nearby (Whole Foods saves the day again). Cook the onion, bell pepper and garlic with some olive oil in a pan over medium heat, until the onions are translucent. Meanwhile, in a rice cooker, add the annatto, bay leaf, cumin and paprika to the rice and water (or stock) mixture, along with some frozen peas. Some people cook the rice in a pot, but I find that I get a more consistent and just-right texture when I use a rice cooker. Add the cooked onion and other ingredients to the rice mixture, and then cook. 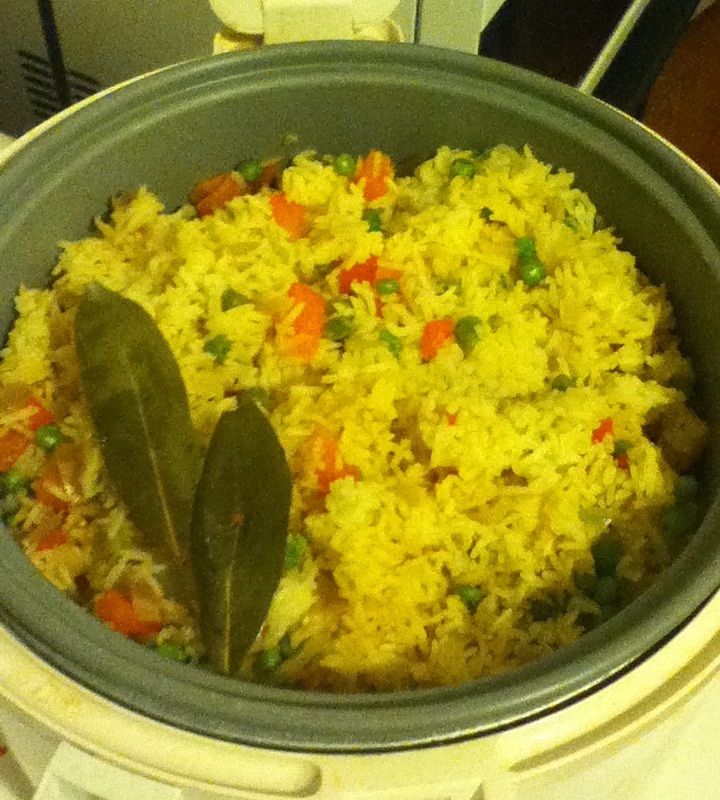 I made more rice than I usually do, plus there were other ingredients involved, so it took the rice cooker a little longer to cook everything, about 30 minutes total. After the rice is done, salt to taste and then garnish with cilantro and pimentos if desired. Depending on what is being served with the rice, adjust the level of salt as necessary. I didn’t much salt the first time I made it, because I expected the chicken and pork to be flavorful enough, which they were. -Thursday, March 1, 2012: The dinner was at Mariposa, and we welcomed H.ly from her month-long travels. This entry was posted in Cuban, Recipes, Side Dish and tagged Achiote, Annatto, Cuban, Rice, Versailles. Bookmark the permalink.